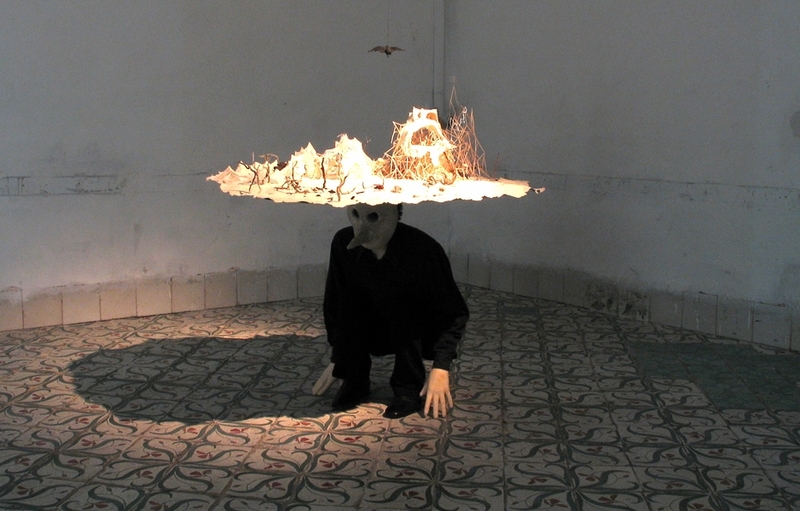 Vertigo was an exhibition curated by artist Martin Ålund and assistant curated by Power Ekroth at Villa San Michele in Capri, Italy, 2004. Below the catalog essay by Power Ekroth. Full catalog for download on PDF here. At the wall in the studio I have at my disposal in Istanbul some earlier resident (probably German) has scribbled with a pencil “wer glücklich ist, bleibt am platze.” It took me more than a week until I noticed the phrase/piece of art (?) and the only reason that I saw it was that I was walking around in the studio trying to solve a problem, and at the same time trying to keep warm (the summer heat was still a month away). Symptomatically I was just in the middle of Jack Kerouac’s novel On the Road, and even if I didn’t enjoy the novel as much as I would have if I had read it some years ago, I definitely had identified myself in the lead character’s need to travel, to discover new places. The quote on the wall really started to bug me. There is no glamour in the life on the road, which is a point Kerouac makes perfectly clear to the reader, and I do not wish to romanticize the life on the road, on the contrary. Living the so called “nomadic art life” is really about trying to stay alive on a minimal budget, but at the same time trying to be able to live a life without too many limitations, however dusty and dreary at times. As unglamorous it may be, the life on the move, constantly in transfer from one place to another, have a special kind of attraction too. To speak with clichés it is the rush and excitement of freedom, total freedom that attracts the most. The mixture of joy and also fear of the new and unknown things is what juggles me and keeps me hunting for more “kicks,” just like Dean and Sal’ in On the Road. I guess it is an addiction. It is also exactly what makes me happy – glücklich – I think. Damned fool, I thought, writing something as stupid on the wall as if it was a universal truth, and perhaps it is the truth for most people, but not for me, I said to myself. But why did it bug me so much then? Well, of course it was the notion that the writer actually could be right, I could very well be wrong and be utterly unhappy at the moment without knowing it, while impatiently trying to go from one city to another without pulling the breaks. Going to exotic places and meeting new people from all sorts of backgrounds is one way of trying to understand the other or just to see the things one does not know of, or fear, to beat the curiosity within. I suppose it is a combination of trying to become in control of something uncontrollable and in this respect I guess it has something to do with the feeling of the sublime, in the Kantian understanding. I keep coming back to a description Immanuel Kant wrote about the sublime, that you can experience the sublime for instance when out on a rowboat on safe distance watching a violent eruption of a volcano. The view of this is “sublime.” It is perhaps about to master something you know that you cannot master in the end, and this makes us very observant of our self, our body, or imperfections, and our mind. The sublime makes us understand how we are at one time subjected to the laws of causality, but also “endowed with freedom”. Kant’s thoughts on beauty and the sublime was something repeated in absurdity when I attended art theory classes ten years ago. What interests me about this in relation to my personal thoughts on place, space and happiness is how Kant is connecting the sublime with the free will. I can clearly see how I, quite vainly, see the sublime as something like being on the road and how I connect it myself with being free, having a free will and how I am able to control my situation and my own sense of being happy on the road – its all about my own decision and my own will – at least so it seems. But of course, now I’m starting to go out on thin ice, and I’m starting to question: free will, is there such a thing? ; happiness, could there be? ; and finally; can there be truth? All too big ‘a questions, for me at least, and I will just agree with Albert Camus and say that “Sorry, no, I don’t think that the world is reasonable” and leave the questions at that. Post-modernism, identity, gender… All issues heavily debated within the art world during the past decade. In the latest years globalisation have been the mantra in the art world and elsewhere. Not only globalisation and the “glocal,” but also the cross-fertilization of genres of art, of classifications, of the borders between countries, cultures and so on. Most of it is of course just politically correct wishful thinking about the disablement of borders, hierarchies and so on but not yet true. All the same, changes have been made and the world is just a little bit smaller today than it was yesterday – at least for us “westerns.” Things are most certainly a lot different for someone illiterate in a small poor village in the African continent without an Internet connection. For this guy, the gap between “us” and “them” is unbridgeable, and so vast it could very well be the reason for a heavy ‘vertigo’ and nausea. But never mind that now, point being that the centre and the periphery, which have been in focus for thousands of catalogue texts by now, at least in the art world, are now being just a little it blurred. The Gwanju Biennial in Korea or the Istanbul Biennial in Turkey are almost as important and prestigious as the Venice Biennial in Italy, and curators are trying their utmost to keep up with the latest news from far away places in the Far East, Middle East or Africa, trying to find interesting artists that perhaps could fit into their concept for the next exhibition. (Yes, right here would be good place to admit that this is one reason that brought me to Istanbul in the first place.) At the same time, there seems to be an ever-increasing interest for the national, for the smaller perspective projected against the wider one. Differences and similarities can possibly become clearer within a smaller context, and reasons for bridging gaps or crossing boundaries can be found. A torn word like “understanding” should be used with careful distance, but at least there are intentions for it at hand. And perhaps is it so, that its really the persons roots that build the contexts for our personalities from which we cannot escape? If this is the case, smaller exhibitions based on the nationality of the artists does certainly have its own “raison d’aitre,” and would be the actual reason why the international “mega show” becomes interesting at all. This is where we are now, but where does it take us next? If the German scribbler is correct in supposing that where we are happiest we tend stay, I have to state that this place is on the road – on the road toward somewhere else. At least it is for me. Next kick, please! Invite for the exhibition. Image by Martin Ålund. All images from exhibition by Martin Ålund.